Watching Joe's hand positions and listening to each note in the chord will improve your ear and enable you to learn at a faster pace. Every major, minor, seventh, diminished and augmented chord is demonstrated and systematically taught. 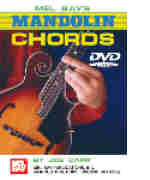 Keep this DVD close whenever you are working on new material and need to learn the correct chords. It will make learning the chords a lot more fun. Download now from PlayBetterBluegrass.com!